One of the best ways to get more sales and customers as a local business is to show up and reach the world when someone whips out their mobiles and searches for a particular product or service on Google. It is essential because it will show your business in front of a potential customer who is willing to purchase the product or service related to the search query. As a business owner, you might have heard about Google Ads, or maybe you have tried it and didn’t get the expected results. Running an Ads campaign is an art, which if followed correctly, can be very beneficial and fruitful for your organization. In a recent study, it was found that businesses make a profit of average $2 for every $1 they spend on Google advertisements. In this guide, you will know everything about Google Ads which will help your local business to generate more sales and revenue. First of all, let’s know what Ads is? Ads ( previously known as as Adwords) is a well-known advertising platform by Google which helps in placing advertisements on Google and its partner networks. It allows businesses to set a budget for their advertising campaigns which is only deducted when someone clicks on the ads. However, it has been observed that visitors from paid advertisements are 50 percent more likely to buy something as compared to organic search visitors. 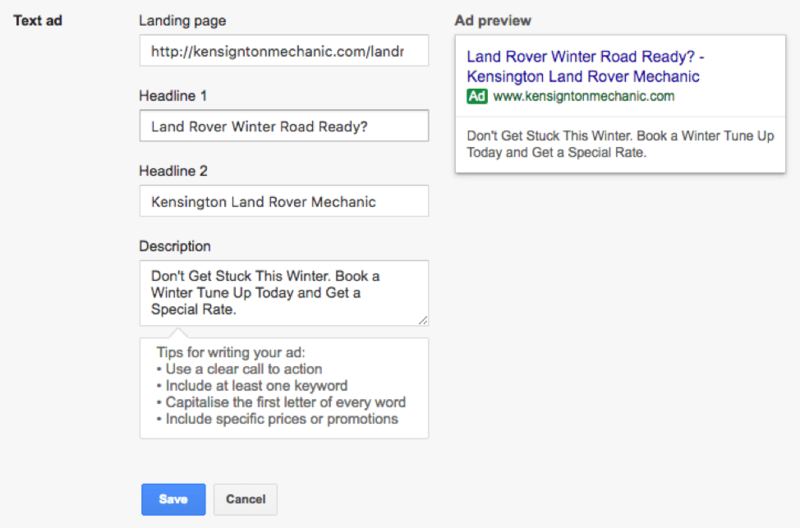 Using Google Ads, you can move a step ahead and appear even above the first search result. The primary goal of the advertisement is to grab the attention of the potential customer so that they visit your website to purchase your product or service. The best thing about Ads as compared to other advertising network is that you are only charged when someone clicks on your ad. If they scroll down without clicking on your ad, then you don’t have to pay any money. So, How Can a Local Business Benefit from Ads? Google Ads is entirely dependent on the search queries of their users. What you need to do is create advertisements related to the top searched keywords of your potential customers. Your advertisements will be shown to only those people who you choose while setting up the ad campaigns. 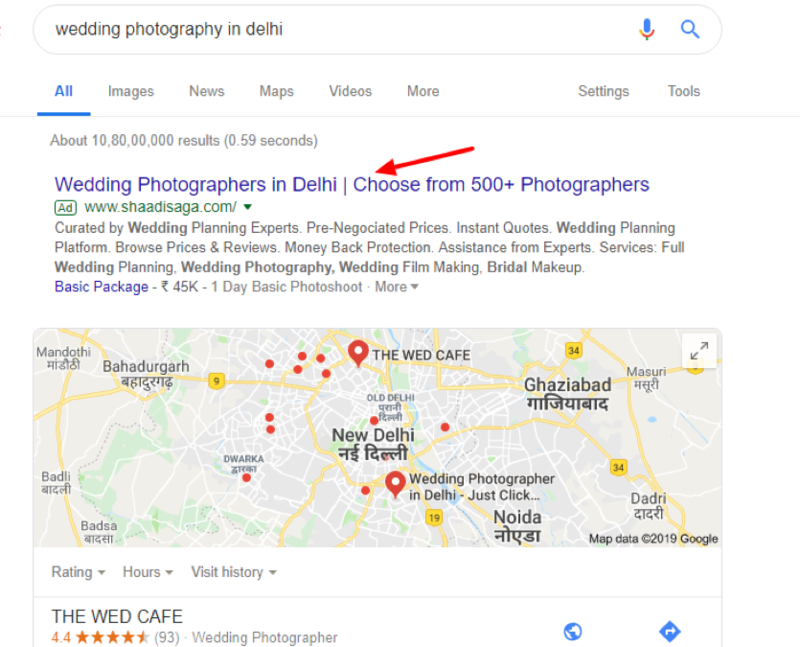 It is very beneficial for local businesses as the ads will be shown to people who are using keywords related to your business in a particular location. You can also hire a PPC expert who can create adverts around specific targeted keywords within your local area. 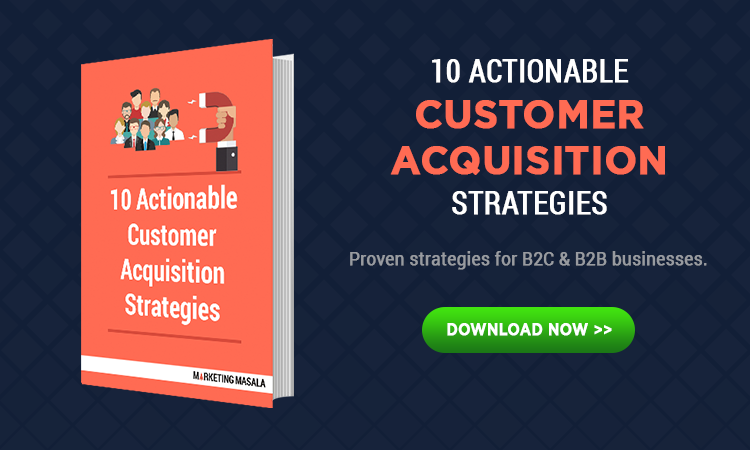 It will help your business in finding a new set of clients who might not have heard about your company or enterprise before. Looking at the increasing demand for Pay Per Click marketing, one can make a wise decision of undertaking a PPC Specialist course that will provide useful insights to marketers and professionals, thereby, enhancing their skills and abilities. Before creating any ads, you need to clearly define what goals and outcomes you need to achieve from your campaign. Most of the local businesses spend a lot of time creating ads but mostly get poor results because they don’t have a proper goal in their mind. You would also need to do some in-depth keyword research to find out the relevant keywords which your potential customers are using in the Google search. Keep an eye on your competitors and notice for which keywords are they popping up on the search results page. If they are running any adverts, check their headlines and their ad copy. There are many tools available which help to spy on your competitors like SpyFu that helps you find the most profitable keywords and ads. Now let’s learn about how you to set up your Ads account. 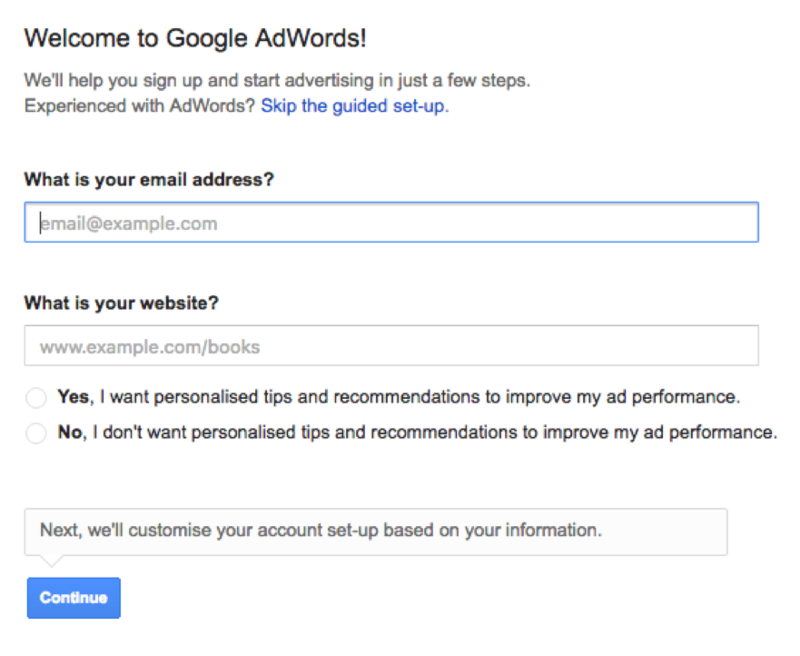 Go to the website of Google Ads and create an account. You can use your existing Google account, use that or create a new one related to your local business. After creating the account, you would be redirected to a page where you can see the four steps for creating an advertisement. The next step is to set your advertising budget. The significant benefit of Ads is that local businesses can set a daily budget and can change at any point if they are not satisfied with the ad’s performance. It is crucial to choose your target audience carefully because you don’t want to waste your valuable time and money on reaching users outside your local area. For example, if you own a restaurant in Delhi, you don’t want to show your ad to the people of Mumbai because even if you have created the best advert possible, it’s no use to the residents of Mumbai. After selecting your target audience, you would see the networks box. You would need to choose whether you want to show your ad on both search and display network. In the search network, your advertisements will be visible in Google’s search results page. So, if a user types in Google search, best law firms in London your ad might show up. But if they search the same thing on the other search engines like Bing, Yahoo and others your ad won’t be displayed. In the display network, your ad will be visible on the websites which are approved by Google. Picking the right keywords is one of the most critical aspects of any Ads campaign. If you choose the wrong keywords, then your whole campaign will move towards the wrong path. To find the most appropriate keywords you need to ask yourself just one question? What would I type in Google to find my business? Those are the keywords which you would want to use in your campaign. There are several types of keywords in Ads. Broad match – It allows your advertisements to show for keywords and its variations such as synonyms, wrong spellings, and others. Broad match modifier – In this, your advertisements will show for your broad match keywords and its close variations. Phrase match – It allows your adverts to be visible for the exact phrase or its close variations. Exact match – It allows your adverts to be visible for the exact keywords with no other words. Ads allows you to add negative keywords to your campaign so that your adverts will not reach to the people who aren’t interested in your product or services. Yes. If the users who don’t need your product or services click on the advertisements, then you are losing money. For example, when you type “calendar” on the keyword planner, you would see the list of related keywords. 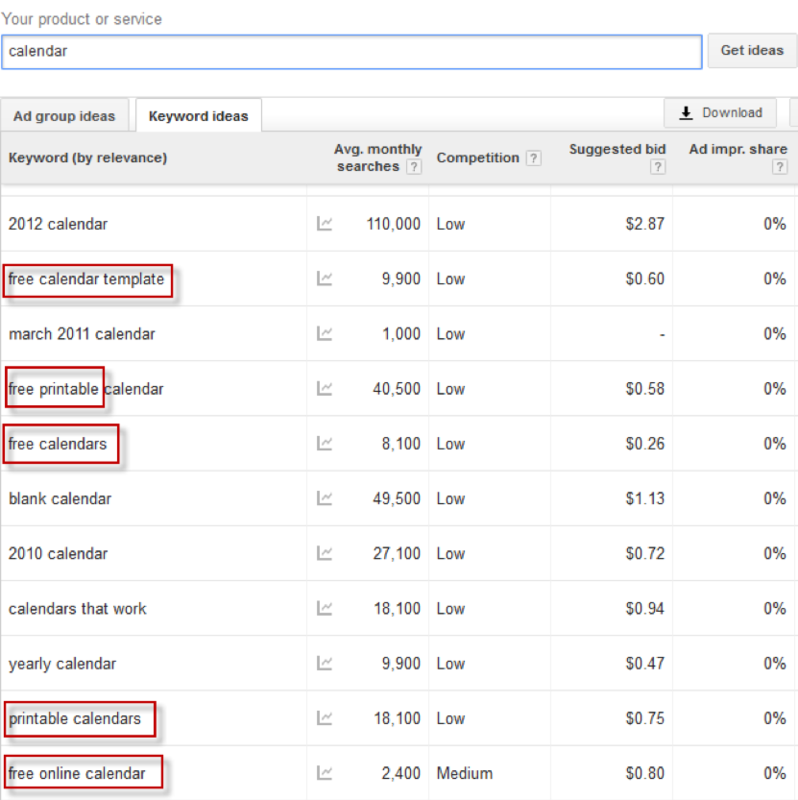 If you sell calendars, then you wouldn’t want to add the terms like ‘free’ and ‘printable’ in your keyword list. So, consider adding them in the negative keywords list. In this, you can allow Google to set your bid automatically depending upon the performance of ad sets. You can also manage your bids manually. If you want to set the bids manually, it is advised to use the Google keyword planner tool for finding the estimated CPC of each keyword. There are various factors which go into bidding like your bid budget, your competitors budget and also the quality of the landing page. All these factors add up and create the Quality Score. Higher the quality score of your ad the better the chances of it being shown up in the search results page. Writing your ads is the most important part of your campaigns. Hence, just don’t write something within a few minutes and submit. You need to write a compelling ad copy so that people get convinced to click on the advert. There aren’t many characters to use for writing ads, hence keep it to the point. Your headline should be something which draws the attention of the users so that they click right away. Place the call to action information appropriately. Your users should exactly know what they need to do. A landing page is a page where the users are sent when they click on their ad. It’s essential to have a good landing page because it is one of the factors of the quality score. A beautiful professional landing page helps in converting users into leads and customers. Most of the local businesses landing page has about 5 percent conversion rate. So, if you put effort into creating a great landing page, then the conversion rates can easily be doubled or even tripled. Ads provides three headlines of 30 characters each. You need to understand that headlines should be engaging so that it conveys the needs and emotion of the ads. Also, highlight important keywords on the headlines to catch the eye of the users. You can test multiple headlines to find out which one works the best. Previously, Ads used to provide just one description of 80 characters, but in the recent update, Google has allowed using two descriptions of 90 characters each. In this space, you can inform your customers about the product and services of your enterprise. It is advised to use a firm call to action and tell the users what they need to do. Make sure there is no spelling or grammatical mistakes in your description and always triple check your ad copy before clicking on the final submit button. 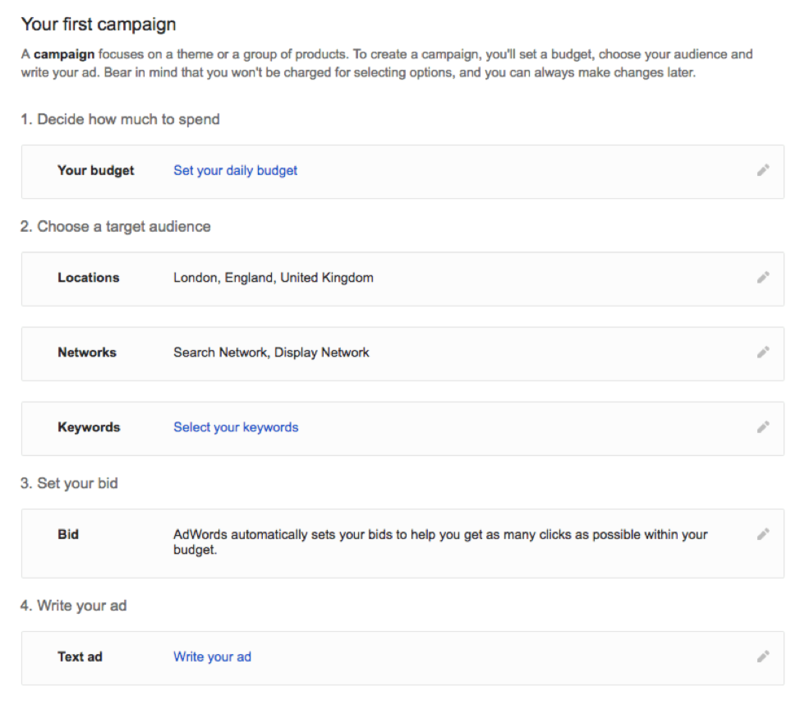 After launching your first campaign, you need to track how your adverts are performing. It helps in understanding if you have created a successful advertisement or there is something you need to change. It is very easy to track your progress in Google Ads. Firstly, you need to know what kind of conversions you want to track and what is the final goal of creating these adverts. Websites – When a user performs an action in your site such as signing a newsletter, filling forms, etc. Phones – In this someone calls you from a mobile device after going through your advertisement. Imports – It’s the situation when a user sees your advert and contact you at your office. In this case, you have to import the data in the Ads manually. Google Ads should be an important part of any local business marketing strategy. I hope with the help of this guide you can easily start the first marketing campaign for your local business. Don’t be reluctant to experiment and test different strategies. It will help you to find what is best for your business. 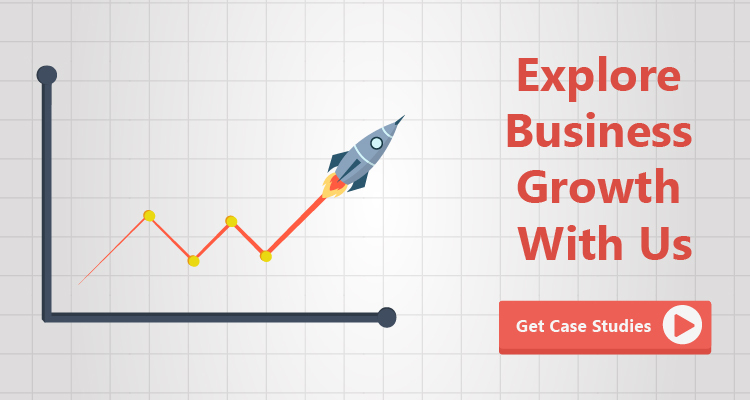 Danish Wadhwa is a HubSpot certified marketing expert and IT pro. With a handful of experience in the web, he has served a number of clients across the world. As a tech-savvy person, he believes in experimenting with new tools and techniques.